Until John Emmett rose from the dead into his life, Laurence had almost convinced himself the war was history but now he saw that its aftershock rumbled on and on, and that peace had nothing to do with signatures and seals on a paper. Although I’m only posting it now, this was the first review I wrote post-dissertation. The past few months rusted my review-writing muscles a little bit, so I decided to ease my way back in by using a review questionnaire created by Dewey, a much loved and missed book blogger who passed away in 2008. Dewey’s blog is sadly no longer available, but the questionnaire was backed up by Joanne at The Book Zombie so that bloggers could carry on using it. Plot summary: The Return of Captain John Emmett is a historical mystery set in 1920 Britain and dealing with the repercussions of the Great War. Laurence Bartram, our sleuth, survived the war unharmed, but he lost his wife and baby son while he was away. He thinks he has put the war behind him, but one day he’s contacted by Mary Emmett, the sister of his old school friend John Emmett, who wants someone to help her make sense of why her brother took his own life. Laurence’s investigations put him in contact with a world of long-term personal and social consequences and unhealed wounds – including perhaps his own. First of all, I liked the setting. You only need to say “1920’s London” for my ears to perk up, and Speller is great with the period detail. I also liked the way the novel dealt with themes such as shell shock or post traumatic stress disorder, issues of class in the military, psychiatric care, the subversive aspects of wartime poetry, and early twentieth-century notions of bravery and cowardice. We expect a book written today, even if it’s a work of historical fiction, to be sympathetic to characters that show signs of fear in a war context almost by default, considering what we know now about how people react to highly traumatic situations. But the most satisfying explorations of the theme are the ones that remain sympathetic while also acknowledging the complications that existed then – what was at stake for those involved in terms of reputation, social standing, psychological repercussions for their fellow officers or soldiers and families, and so on. 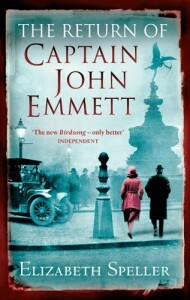 The Return of Captain John Emmett does all of the above considerably well. As I write this, I keep thinking of my ongoing discussions with Jodie about how the second season of Downton Abbey will handle the same themes. It will be fun to compare the two narratives over the next few weeks. I can’t quite put my finger on why although I mostly enjoyed this novel I didn’t love it quite as much as I was hoping to. There was nothing much wrong with it, exactly, but it lacked that extra edge somehow. Perhaps the fact that I didn’t quite connect with Laurence Bartram was the reason, but I’ll get into that when I answer the next question. Laurence Bartram struck me as a bit of a Nondescript Officer with a Traumatic Past. By the end of the book I didn’t really feel like I’d gotten to know him, even though I know I was supposed to. Much of the emotional power of The Return of Captain John Emmett comes from the fact that as Laurence investigates what happened to his old friend, something in him breaks loose and he’s forced to confront the fact that what he went through had an emotional cost. I suppose that if I’d felt more invested in Laurence’s storyline, I’d have found the ending quite moving, but the truth is that I didn’t. Whatever the reason, his story never really resonated with me. Still, I was interested in the main mystery, and that alone kept me reading. I really liked the two main female characters, Eleanor and Mary Emmett. Eleanor is a former nurse that Laurence meets over the course of his investigations, and who knows more than she’s initially letting on; Mary is of course John Emmett’s sister. Both are smart, competent women, and both feel the consequences of the war in very personal ways. I don’t want to give the whole plot away, but suffice to say that they were both affected in more ways than are initially apparent, and take on the role of caretakers of wounded men. Even more interesting was the fact that Elizabeth Speller used these characters to explore the way the war created silences and divisions between the sexes that had to do with what men and women were expected to be able to handle, and which of course forbid any real intimacy. The men didn’t really talk about what they had seen or endured, and the women were taught not to ask, which only created further distance. But as Mary eventually tells Laurence, “We’re women, not children”. The silence needed to be broken if any healing was to take place. What did you think of the ending? The solution to the mystery, or rather the way Laurence discovers it, really stretches believability, but I thought the motivations behind everything that was happening were interesting, and I liked the thematic implications. As I was saying before, the ending to Laurence’s personal story left me a little cold, but I think others readers may feel differently. Any fans of Maisie Dobbs — this is quite similar, only more sober in tone (and to me personally much more satisfying). Anyone who likes historical mysteries might enjoy this, especially readers who prefer their mysteries with a bit of social commentary on the side. The Return of Captain John Emmett reads like a stand-alone, but there’s a second novel starring Laurence Bartram called The Strange Fate of Kitty Easton. So if you’re looking for a new series of 1920’s mystery, especially one darker and with more depth than Daisy Dalrymple or Dandy Gilver, this would be a good bet. I really enjoyed this book, but I agree with your assessment of Laurence Bartram. In many ways, he seems a device for telling the story, rather than a character in his own right. I did think he came more to life as the book progressed, and that the author intended for him to gradually take on more vitality. I look forward to Speller's next installment. Nice review, Ana! I love your review's format :) I got to know about Dewey when I participated in my first readathon. It is sad that Dewey's blog is no longer available. This book's period setting is quite interesting and the mystery seems to be quite interesting too. I loved the line you have quoted - "We’re women, not children". It is simple and powerful and says so many things at different levels. That is a nice outline for a review. I'm a believer in any writing trick that helps you get the words on paper, and this one has the added advantage of getting you to talk a little about the specifics on which you base your impressions. That's what I'm mainly looking for when I read a review, because tastes can differ so much. Not that yours differ that much from mine. But still. This is a Virago one isn't it. As I was reading your review, I kept thinking that I was sure it was connected to another book and then you mentioned the other one. I haven't read anything set in the 1920's in ages. It does sound brilliant. I love the questions too! I love historical mysteries and London in the 1920s is a great setting. My mom loves Maisie - I'll have to get this for her. I agree that Maisie Dobbs fans who wished for a bit more mystery in the books will like this. I totally understand what you're saying about Laurence. He seemed a bit bland and less vivid than some of the secondary characters. Nevertheless I thought it was an very good book. Excellent point, by the way about the comparison to the upcoming (not till January here) season of Downton Abbey. I really enjoyed this when I read it last year. I thought the mystery plot was interesting and I loved the 1920s setting, but I do agree that Laurence wasn't a very strong character. I haven't read The Strange Fate of Kitty Easton yet but will hopefully get to it eventually. Hm. Shame. My ears also perk up when I hear "1920s London", and when you toss in posttraumatic stress disorder and other issues of mental health, it sounds like very much my cup of tea. But apparently -- like the Daisy Dalrymple books! -- it perhaps is not. When will someone write a book set in this time and dealing with this subject matter that I will love? Won't somebody think of the bloggers? I have this book out from the library right now. I have been curious about it and the library bought it for me. I think I really need to read this! Not sure why I haven't yet. Btw, I recently borrowed The River of Darkness by Rennie Airth which is also the first in a historical mystery trilogy set in the 1920s and supposedly quite realistic. Not sure whether you've read it. I had been very curious about this book due to its subject matter and time period, and your review makes me really eager to try it. I liked the style of this review as well, and liked how you related the different aspects of the story to us in it. Jenclair: Yes, quite possibly she'll flesh him out more as the series progresses! At first I thought this was a stand-alone novel, which was why I was a bit frustrated with that aspect of it. Vishy: It does, doesn't it? Such a simply fact, and yet one so many people struggled (and struggle) with. Jeanne: Yes, the specifics are what I look for in other bloggers' posts as well. They're what helps me decide if the book is for me or not, regardless of how the blogger felt about it. Vivienne: Yes it is! And it's always hard to go wrong with their books. reviewsbylola: One of my favourite historical settings! Kathy: It will definitely appeal to fans of the series. There seem to be quite a few mystery series out now with this setting! I have this one on hold at the library waiting for me to pick it up!